What do you do when you find yourself in a really yummy city like Vancouver? Any reasonably food-obsessed person would carefully prioritize the restaurant choices, make reservations, ask waiters for dishes not to be missed, and try to squeeze in as many optimal meals as possible. To help narrow down the restaurant list, I wrote to Mark Busse, the creative brain behind Industrial Brand Creative design firm and food blog. We started with a restaurant discussion and ended up with an invitation to have dinner with Mark and his wife Andrea when Jason and I were in town. “You should bring your chef’s knife,” said Jason. We rented a little studio with a kitchen just in case we decided to cook, but would we really want to? 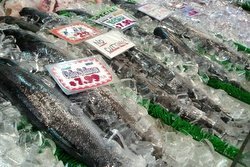 Before we leave on any trip, I expect my usual cooking craving to subside given all the interesting restaurants we could be exploring, but I always end up regretting walking away from the market empty handed. I think Jason knows me better than I know myself, and I know better than to argue with him. I put a guard on my knife and carefully placed it between my clothes in the suitcase along with a little zip lock bag of kosher salt. Just in case. 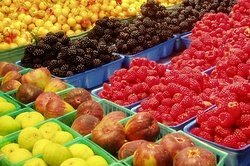 Once I saw the juicy raspberries, perfumy mushrooms, and glistening seafood at Vancouver’s public market on Granville Island, I was glad I packed that knife. Meeting Mark’s friend Colin, during our dinner at West, only poured oil into the fire. Colin was our waiter, thanks to Mark’s recommendation, and his encyclopedic knowledge of food and advice about the markets, bakeries, and wine stores was putting all kinds of ideas into our head. Somewhere during our dinner, between the melt-in-your-mouth sable and the most succulent lamb we've ever had, we formulated a plan to turn our Wednesday get together into a cooking night. Colin's mention of the lobster stock in his freezer that he wanted to turn into a risotto sealed the deal. Mark and Andrea were surprised, but gladly jumped on the cooking bandwagon. 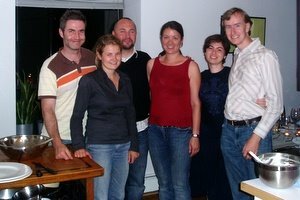 Couple of e-mails later, we worked out a menu for a get together chez Colin and Kristil. Early Wednesday morning, Jason and I walked to False Creek, and took the ferry to the market on Granville Island. 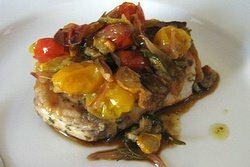 After walking around the fish markets and veggie stalls we finally decided on rosemary and garlic marinated marlin with roasted squash, zucchini, and cherry tomatoes. Mediterranean food is your best friend when you travel -- no spices and no pantry items besides olive oil. At 6:30, marlin and a bottle of wine in hand, we rang Colin’s apartment. As the elevator door opened, a guy with a big smile stepped out and said, “I know who you are!” It was Mark. He was just like I imagined him -- a ball of epicurean energy and hospitality. We opened the wine and toasted to our meeting. Then we cooked, and talked, and ate, and laughed, and drank, and ate some more. I wondered how many times Mark and Colin cooked at the same stove to get this comfortable with each other. It was a whirlwind of chopping, stirring, whipping, folding, searing, sprinkling, seasoning, and tasting – like the organized chaos of a jam session. They made putting together a 4 course meal on a weeknight seem like a breeze. And what a meal it was! We started with marlin and roasted summer veggies paired with Dr. Loosen Riesling. Jason tried to choose a wine to match the sweetness and tang of roasted cherry tomatoes and it worked like a charm. I got so caught up in talking that I overcooked the fish a bit, but the saucy veggies came to the rescue. 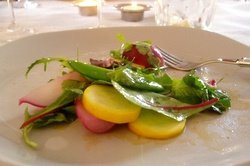 Next came a salad with summer squash, snap peas, and radishes. I was wondering what the secret to Colin’s dressing was. Honey. As Kristil told us over dinner, Colin takes honey very seriously and has quite a collection. 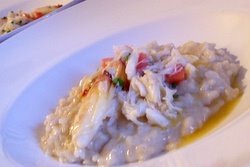 The lobster risotto topped with local dungeness crab and beurre blanc was to die for. I picked up a great tip from Colin for separating the grains and giving risotto a light and creamy texture – fold in some whipped cream right before serving. I also learned that Viognier is a fantastic match for crab. 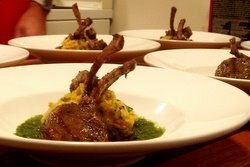 Next was the rack of lamb that Mark so carefully trimmed and marinated in his office kitchen. Doesn’t everyone have a little test kitchen in their office? It was served with a watercress puree and olive crushed potatoes and paired with a BC pinot noir and a Spanish Campo di Borja Crianza. Now, how often do you get to try two wines with a dish? The lamb was from an island off Vancouver coast. Those Vancouverites are lucky to have lamb this tender and juicy and Mark’s marinate of vodka and cherries was simply fabulous. For dessert, Colin intended to make a tart with rosemary custard and figs, but the dough wouldn’t cooperate. Having years of experience with baking disasters, I suggested we crumble it up and sprinkle on top of fruit. 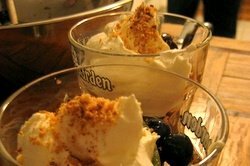 Colin added a creative twist to this idea and made parfaits with layers of fruit, custard, and buttery crumbs. Paired with Okanagan valley dessert wine, that Andrea brought from her recent trip, it was a sweet ending to a fantastic meal. We’ve discovered Vancouver’s best kept secret – Colin’s kitchen. It was the most memorable meal of our vacation -- not only because the food was great, but because it was prepared from the heart. These guys’ passion for their beautiful Vancouver was contagious and we could taste it in every bite. We hope to do this again soon, this time in Boston. Restaurants are so wonderful but friends and cooking with friends always tops it all. Sounds like a very magical evening. What a lovely story. That is the best kind of fun, isn't it? Thanks for sharing it. Do you remember the name of the Pinot Noir? I am curious! 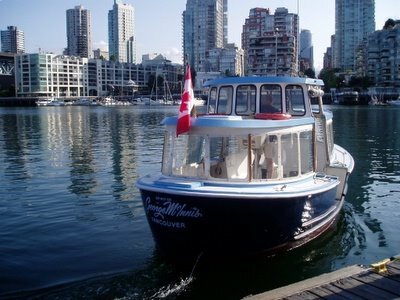 Glad you had such a good time in Vancouver - I love Granville Island too, so inspiring you can wander for hours. It was Quail's Gate Limited Release Pinot Noir 2003. I miss Granville Island already, particularly Terre Breads and Oyama charcuterie. It looks lovely. Can we have the risotto recipe? I'll ask Colin for the recipe. You can also leave him a comment on his blog (he wrote about this meal too). I am sure he'll be delighted. Here is a link to Colin's post. Ahh yes Quails Gate does make a good Pinot. I took a tour there back in Feb - they also have a really nice release Riesling but I think it is sold out. We went to West last time we in Vancouver. It was fantastic! Unfortunately I didn't get a chance t do any cooking with the great ingredients they have up there. I can't wait to go back though! I can relate to so many of your stories!